With the college football season finally approaching, I ranked each of this season's 78 games involving state teams. The two criteria are the same as last year: How important do I think this game will be, and how exciting is the matchup? Hard to get excited about a Division I-AA team with no local ties coming off a 2-9 season. I haven't thought about the Tigers since Florida State and Oklahoma State blew them out by a combined 139-0 in back-to-back weeks in 2012. A three-win I-AA team isn't going to help the Knights quiet critiques over a weak schedule. Expect a repeat of last year's 45-0 Owls thumping. Would have been higher if Paul Petrino's Vandals hadn't dropped to I-AA. But not much higher. Would have been higher if Jimbo Fisher were still around to face his former school, but the Bulldogs should be a ranked I-AA team, which is something, I guess. Wish the Gators could have found a better matchup for Dan Mullen's debut than a I-AA opponent, even though the Buccaneers have won their conference two of the last three seasons. The Bulls begin the post-Quinton Flowers era against a solid I-AA opponent. The 49ers have only seven wins in three Division I-A seasons, and they still seem another year (or more) away from making a bowl game. A cool homecoming of sorts for Minutemen coach Mark Whipple, a Miami assistant from 2009-10. That's about the only thing this non-conference matchup has going for it. UMass DB Isaiah Rodgers (Blake High) gets to play his hometown team. He was tied for 12th nationally with 17 passes defended (including one pick-six) last year. FSU alumnus (and former Stanford offensive coordinator) Mike Bloomgren will be in for a rough first year as the Owls' head coach. FAU only won this matchup by 30 points last year, and this meeting might not be much closer. Because the Panthers lose so much, they could be in for trouble early, including in their Conference USA opener. This game could come down to ODU kicker Nick Rice, a Plant High product who hit a school-record 15 field goals last year. Only Michigan allowed fewer passing yards per game last year than UTSA. That's bad news for whoever replaces Gaither High alum (and Seahawks draft pick) Alex McGough as FIU's starting quarterback. The Bulls get an easy AAC opener against a Pirates team that has only 11 wins over the last three seasons. I know these decisions are often more about the university's calendar than the opponent, but East Carolina scheduling a potential top-25 UCF team as its homecoming opponent seems like a bad idea. You should schedule a team like the Huskies, who haven't had a winning season since 2010. Much better idea. Wouldn't be shocked if this likely blowout is the last home game of Lane Kiffin's illustrious Owls tenure. A reunion between two Plant City natives (Western Kentucky TE Steven Witchoskey and FIU DE John Broome) adds local flavor to an otherwise unexciting matchup. Two reasons to know Hilltoppers WR Lucky Jackson: 1) He showed promise last season with 600 receiving yards. 2) His name is Lucky Jackson. The Blue Raiders have won five of the last six in this series and return QB Brent Stockstill (son of head coach Rick Stockstill). Good luck to Middle Tennessee DB Cordell Hudson, a Largo High alumnus and grad transfer from Syracuse who will try to slow down one of the nation's top offenses. Bronco Mendenhall has only two losing seasons in his 14 years of coaching — his first two with the Cavaliers. A third could be in the works, and the 'Canes should roll here. This one is sandwiched between an always tough Navy team and rival USF, so it would be a good challenge for the Knights … if the Bearcats weren't in for a down season. The Bulls have won their last three in the series by an average of 31 points. A trip to Nippert Stadium probably won't change the streak. The Falcons are coming off a 5-7 season and might not be better this year. Still, Air Force is a respectable program and a chance for FAU to get one of its most impressive wins since topping USF in 2013. Largo High alumni Frankie Hernandez and Brandon Drayton combined for 125 tackles last year at Marshall. They'll need more in this game, which could have division championship implications for the Thundering Herd. 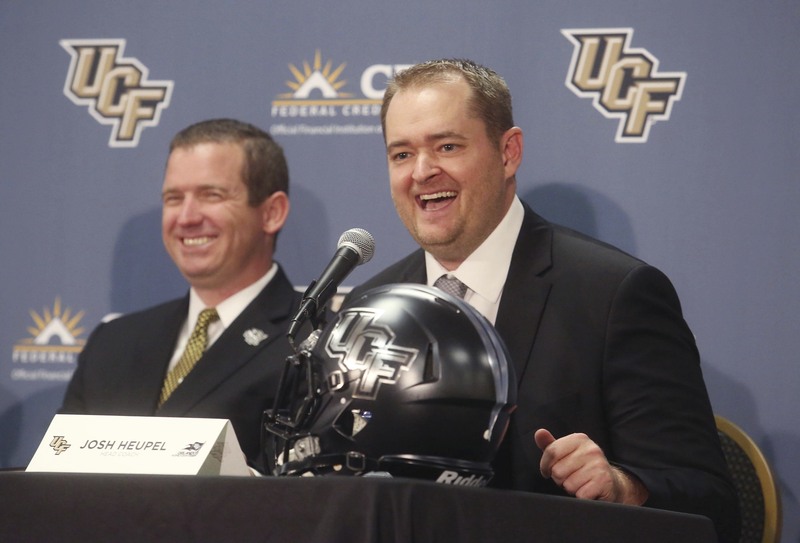 The Josh Heupel era begins on a Thursday night in front of a national audience. The downside: UCF crushed UConn by 25 points last year, and the Huskies aren't much better. Few teams in the country have recruited Tampa Bay as well as Tom Allen's Hoosiers. He'll be able to show off his brand in another recruiting hotbed, while probably earning an easy victory along the way. Tulane has had only one winning season in the last 15 years. If the Bulls have trouble here, at home, that's a bad sign. The Butch Davis-Lane Kiffin coaching matchup is intriguing. Problem is, FAU has a lot more talent and won last year's meeting by 28 points. After failing at USF, Skip Holtz's record at Louisiana Tech (38-28) is almost identical to his record before he came to Tampa (38-27 at East Carolina). His Bulldogs should be one of the best teams in Conference USA and could challenge the Owls. 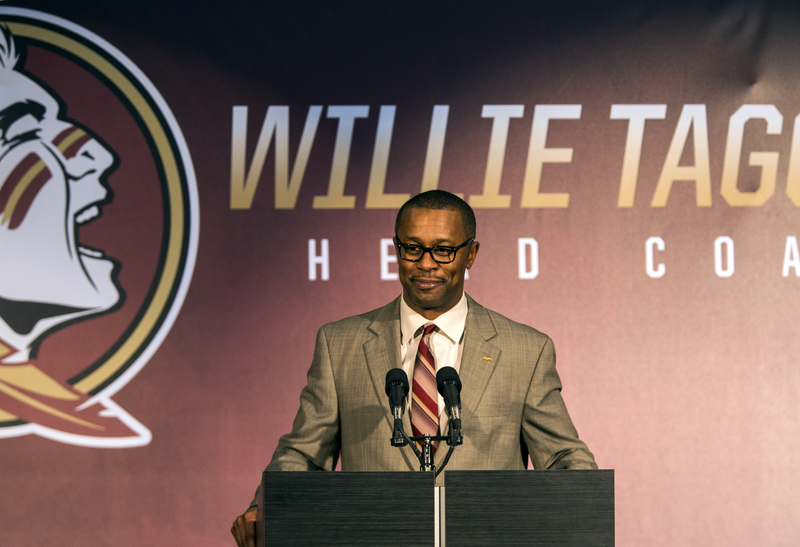 Willie Taggart's 2015 win over Syracuse saved his career and eventually helped him take over the Seminoles. A victory here wouldn't be as momentous, although it would extend FSU's winning streak in the series to 11 games. Since ending a 22-game losing streak to UF, the Commodores are 22-31 overall (including four defeats to the Gators). Vandy seems stuck. Although the game shouldn't be close, I'm curious what sort of reception former 'Canes coach Butch Davis gets. Here's hoping there's no brawl. As tough as this game will be for the Huskies, it might not even be their hardest non-conference game; NIU also plays at Iowa and BYU and hosts Utah in one of the most demanding out-of-league schedules you'll see. Don't expect much defense here. The Mustangs are coming off their highest scoring season (37.2 points per game) in school history and probably won't slow down under new coach Sonny Dykes. The Golden Hurricane probably won't be good (again), but its offense has potential. Bonus points for giving me something to watch on a Friday night. The Wildcats had great chances to end their three-decade losing streak in the series last year but couldn't come through. 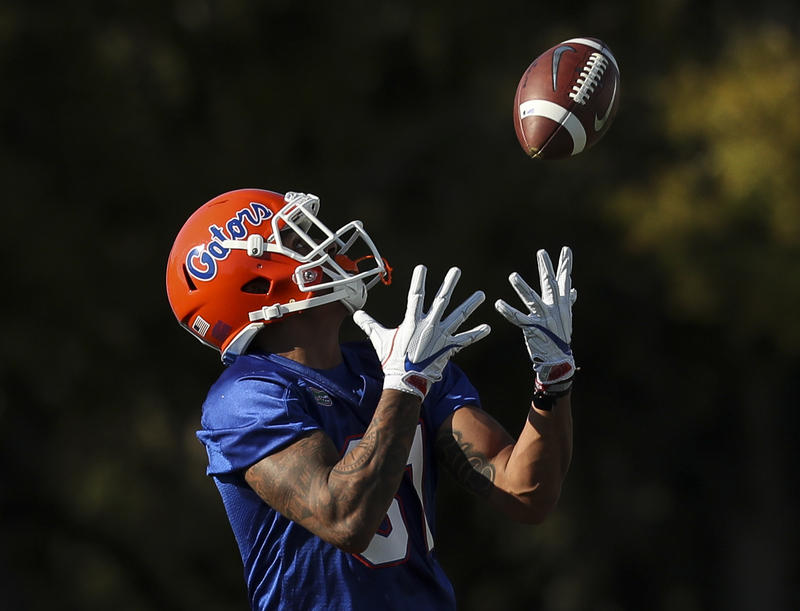 UF shouldn't need Kentucky to leave two receivers unguarded to win this time. If Marshall QB Chase Litton (Wharton High) hadn't left early for the NFL draft, this might have been one of the better Group of Five matchups in the country. It's still pretty good and could decide Conference USA's East Division. A Thursday night game adds a logistical wrinkle to what might otherwise be a lopsided matchup. 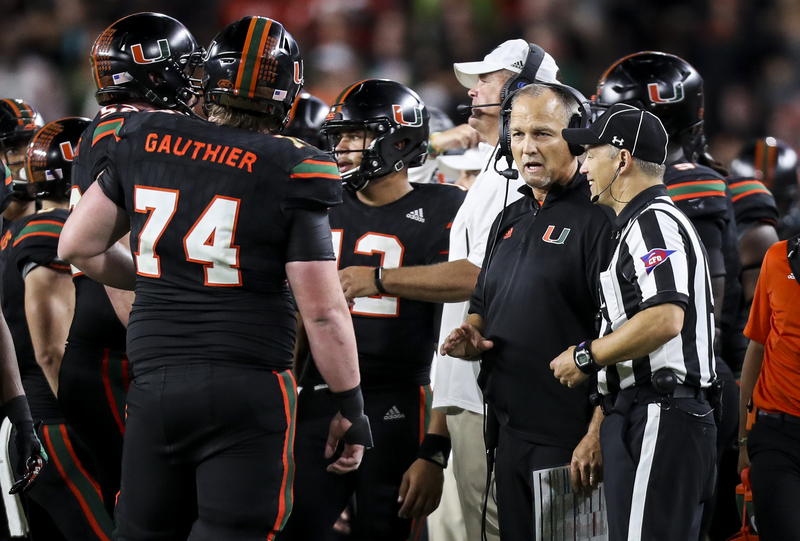 The 'Canes are only 4-4 in their last eight weeknight regular-season games. More intriguing than the Miami matchup because this gives the Knights a chance at a Power Five road win. Unfortunately for UCF's strength of schedule, the Tar Heels might look more like the team than 3-9 last year than the one that beat FSU in Tallahassee in 2016. Coming off a Thursday night game, the Knights get extra time to prepare — which is good for them, considering how tricky Navy always is. The 'Canes have only lost to Duke once since the Carter administration, and it's hard seeing another defeat here. Duke OL Julian Santos (East Lake High) and the rest of the Blue Devils should have a hard time blocking this Miami defense. An East Lake High reunion between FSU WR George Campbell and Wake Forest LB Justin Strnad. The Demon Deacons are poised for a regression after losing quarterback John Wolford to graduation. A rematch of last year's C-USA title game, featuring one of the best quarterbacks you don't know (UNT's Mason Fine) against a high-scoring offense, on a Thursday night? Count me in. The Bulls have won two of their last three games against the ACC and have a legitimate chance of making it three of four, in a homecoming for Yellow Jackets DL Kyle Cerge-Henderson (Plant High). The Knights' other notable non-conference game against a decent enough ACC Coastal opponent. With nine returning starters, this could be the best defense UCF sees all season. Mark Richt is 15-2 against the Yellow Jackets. To get to another ACC title game, he'll probably have to make it 16-2. I like what former UCF (and UF) assistant Geoff Collins is building at Temple. For now, that means competing for second in the AAC East and remaining a notch below the Knights. The Seminoles are 5-5 in their last 10 trips to Raleigh, and the Wolfpack has a talented, experienced quarterback (Ryan Finley). Sandwiched between Clemson and a trip to Notre Dame, this looks like trouble. The Rockets hung with Miami last year, return one of the nation's top receivers (Lennard High alumnus Diontae Johnson) and get the 'Canes after a bye, at home. That spells upset potential. Also, I'm a sucker for MACtion. It's a potential trap game (between Notre Dame and UF), but FSU should be plenty motivated after last year's shocking 32-point blowout loss. The veteran Eagles return 16 starters, including RB AJ Dillon and WR Jeff Smith (Clearwater Central Catholic) and could give the 'Canes a scare on a Friday night in Chestnut Hill. Think QB Malik Rosier wants another shot at the Panthers after being pulled at Pitt in last year's loss? Playing in an NFL stadium isn't really a novelty for the Bulls, and the Illini should continue to be terrible. But Lovie Smith returning to Chicago to face a team from Tampa still intrigues me. Temple ended last year winning four of its last five and is due for a post-Gasparilla Bowl bump. 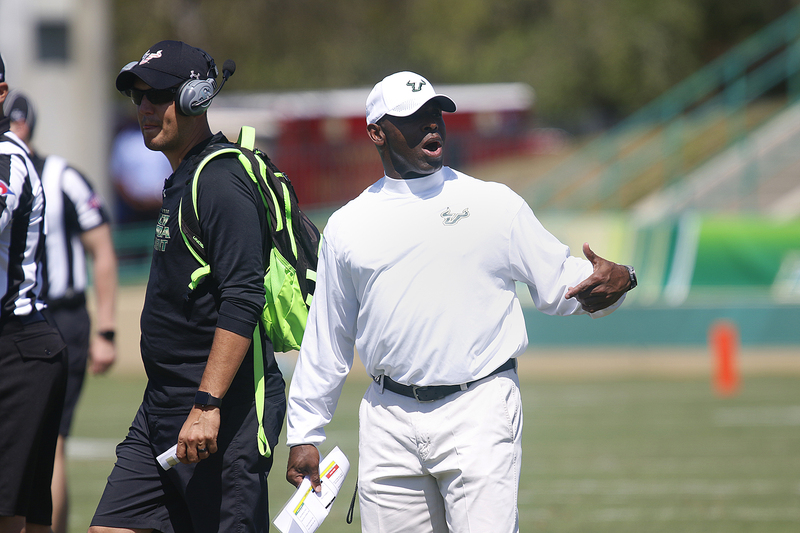 USF shouldn't look past these Owls, on the road, with rival UCF coming the next week. College football will miss Cardinals QB Lamar Jackson. FSU won't, after he beat them twice in a row (including a 63-20 humiliation two years ago in the Seminoles' last trip to Louisville). New QB Jawon Pass won't be able to match that success or buzz. The Tigers have one of the top quarterbacks in the country (Drew Lock) and eight other returning starters on offense. This could be fun, even if it's not meaningful in the SEC East title race. Will Muschamp makes his second trip back to Gainesville, with a solid offense and what might be the No. 2 team in the division. The Owls will rightfully be big underdogs in Norman, but the Sooners will be playing their first game of the post-Baker Mayfield era. Even if there's no upset, it could be an explosive three quarters. Houston DT Ed Oliver has a chance to become the most dominant interior lineman since Ndamukong Suh. He, and the rest of the Cougars, should be the Bulls' toughest road game. I'm not saying the Gators will lose the Jim McElwain Bowl. But I am saying that the stakes involved — a $2 million price to buy out now-former coach McElwain from the Rams — make the potential for an upset really interesting. As mediocre as the Volunteers were under Butch Jones, this rivalry still had some close finishes. I'm not sure that continues in Jeremy Pruitt's first season, even in Knoxville. Dan Mullen went 2-7 against the Tigers at Mississippi State but crushed them by 30 last year. Don't expect a blowout here; the last four UF-LSU meetings have been decided by 17 total points. A rematch of last year's AAC title game should again have major implications (and lots of offense). The Hurricanes have lost seven of their last 10 trips to Blacksburg. Another defeat could cost Miami a second consecutive Coastal Division title. It won't be able to match the drama of last year, when the Jim McElwain era was in its final hours. 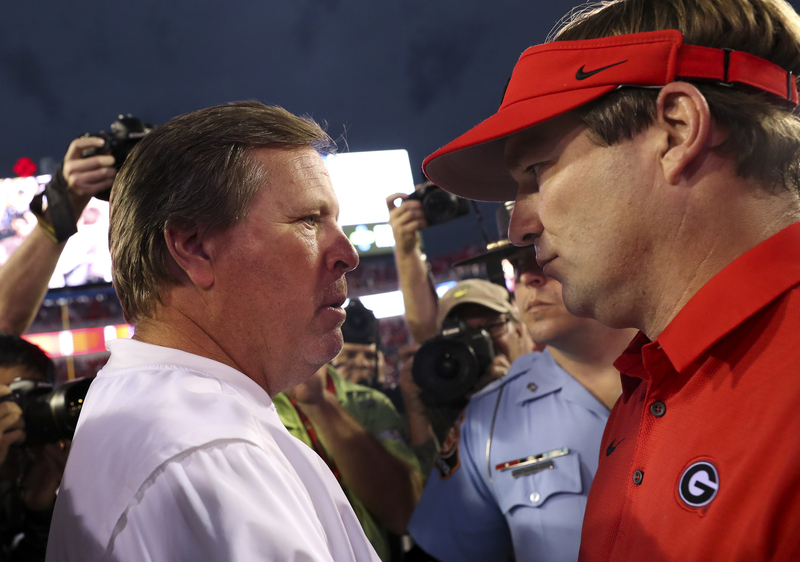 Maybe eventually the drama can happen on the field, but the talent gap between Kirby Smart's Bulldogs and the rest of the SEC East seems too large now. The fact that Ed Orgeron's Tigers aren't playing up to their talent or reputation keeps this game from being higher, even though it's a meeting of two big-name brands at the Cowboys' coliseum. It'll be hard to top last year's shootout, but the AAC-East could still come down to the War on I-4. Lane Kiffin + Josh Heupel = Lots of points. The fact that it's on a Friday night increases the fun factor for the two best Group of Five schools in the state. Maybe Dan Mullen and Willie Taggart can rekindle the national buzz around this rivalry. It'll certainly be more meaningful than last year's slop fest. 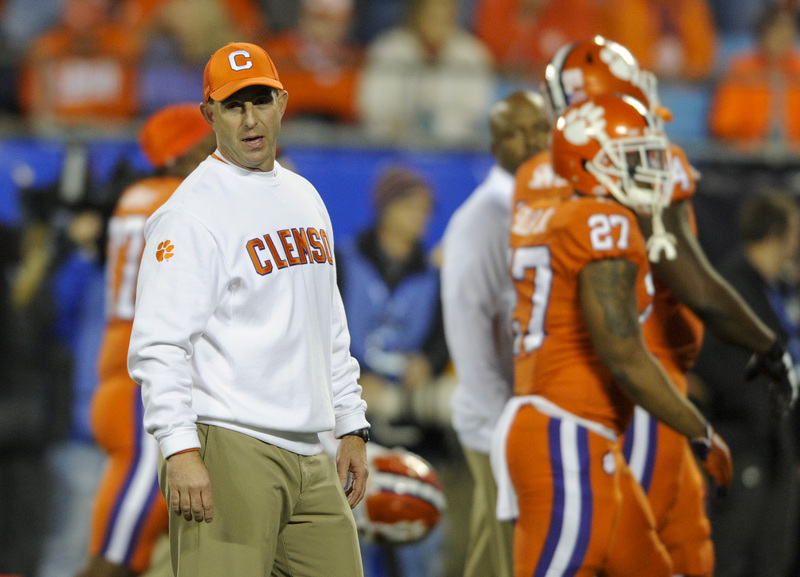 Seems low, but Dabo Swinney's Tigers seem a notch ahead of the rest of the ACC, including a Seminoles team with a new coach. This will still be Clemson's toughest road test, just ahead of the Tigers' non-conference game at Jimbo Fisher's new digs. Twenty-five years after the Game of the Century (one of them, at least), the Seminoles return to South Bend to play a potential College Football Playoff contender. If the Hurricanes are going to be legitimate playoff contenders, they need to beat the rival 'Noles for a second consecutive year. Mullen said on his spring speaking tour that this will be one of the biggest games in the history of Mississippi. 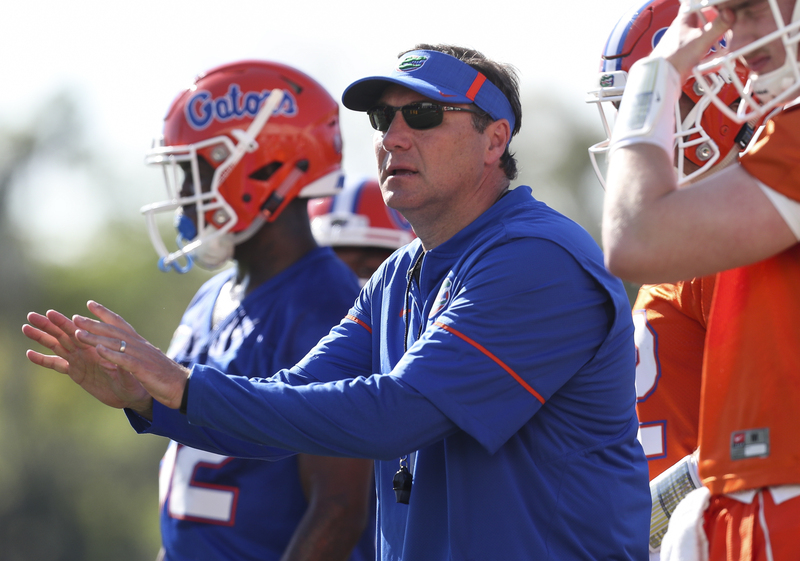 That's a slight hyperbole, but Mullen's return to the school he coached for nine seasons is this state's most intriguing game of the year.